Monster Ski Hire offers the best repair prices in town, with a full Wintersteiger workshop and expert staff to give your equipment optimum performance in glide and edge hold. Whether you’re after a full tune with snow specific, stone ground structure, or just a quick wax and rust removal off your old favourites, our fully trained and experienced staff have all the necessary equipment to get you gliding on the snow. 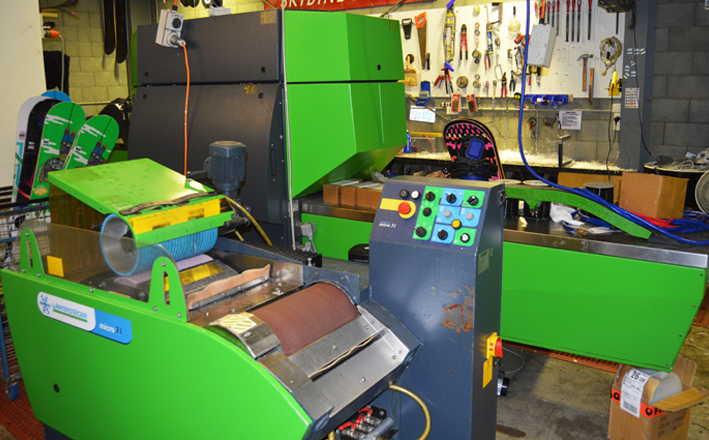 Our Wintersteiger workshop comes complete with a Microjet robot tuner, grinder and edger. We also offer hand/iron waxes and scrape to give your equipment the TLC it deserves. Haven’t waxed in awhile but keen to get to the powder as soon as possible? Give us five minutes with your equipment and our Wintersteiger belt waxer. You’ll be so glad you did when you’re flying past your mates.